Autograph Letter Signed ('Chs G. Greene') from the American newspaper editor Charles Gordon Greene to W. F. Allston, regarding the involvement of 'Capt. Sturgis' [William F. Sturgis?] with a newspaper article. 1p., 4to. Good, on lightly-aged paper. In reply to Allston's letter Greene assures him that 'Capt. Sturgis did not write the paragraph' Allston alludes to, 'nor did he contemplate the publication of his decision in a newspaper at the time he made it known to the gentleman who furnished me with the information'. 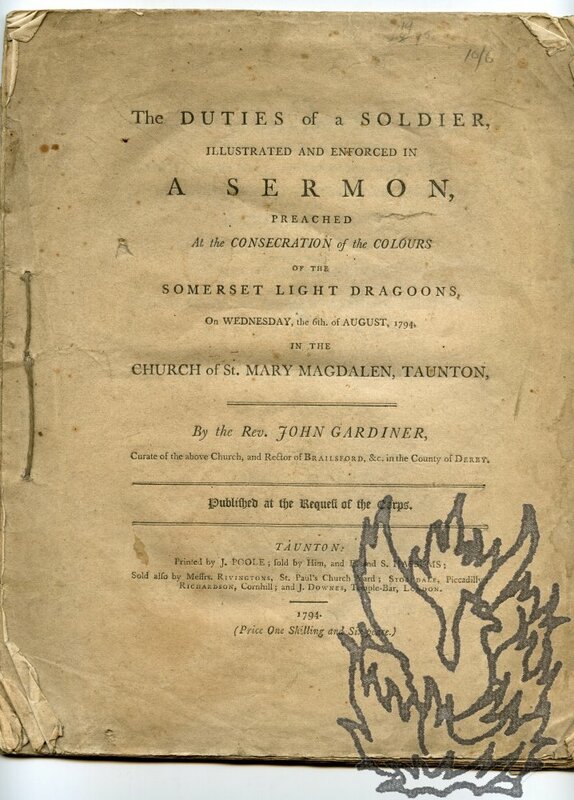 The Duties of a Soldier, illustrated and enforced in a Sermon, preached at the Consecration of the Colours of the Somerset Light Dragoons, On Wednesday, the 6th. of August, 1794, in the Church of St. Mary Magdalen, Taunton. 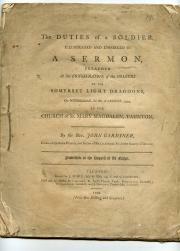 Published at the Request of the Corps. Taunton: Printed by J. Poole; sold by Him, and E. and S. Hassums; Sold also by Messrs. Rivingtons, St. Paul's Church Yard; Stockdale, Piccadilly; Richardson, Cornhill; and J. Downes, Temple-Bar, London. 1794. 4to: 37 pp. Unbound. Stitched as issued. Text clear and entire on discoloured paper worn at the extremities. Central closed tears to the last four leaves, the closed tear to the last leaf being repaired with archival tape on the blank reverse. A production over which the author has taken great care, he having added two autograph footnotes, one of three lines and the other of two, on p.34. Note on p.37: 'The extraordinary length of this Discourse, being more than double that of Sermons usually printed, is the reason for its being sold at the additional price of one half. [i.e.